Peptide DNLNATGTNESAFNC, corresponding to amino acid residues 21-35 of rat AT2 receptor (Accession P35351). Extracellular, N-terminus. Specificity Will not recognize human AT2 Receptor. Standard quality control of each lot Western blot analysis (unlabeled antibody, #AAR-012), and immunohistochemistry (labeled antibody). Immunohistochemical staining of rat frozen free floating brain sections using Anti-Angiotensin II Receptor Type-2 (extracellular)-ATTO-488 Antibody (#AAR-012-AG), (1:20). 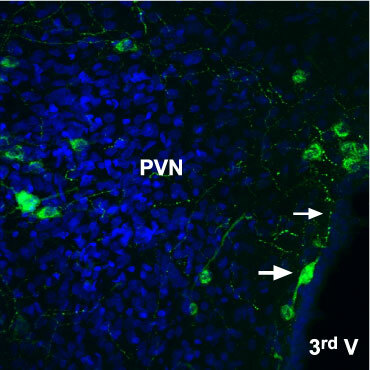 AT2 receptor (green) was detected in neurons in the vicinity of the hypothalamic paraventricular nucleus (PVN). 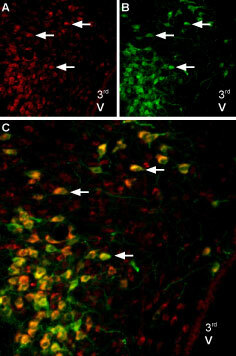 In some neurons (thick arrow), axonal processes with varicosities were observed (thin arrow). Nuclei were visualized with DAPI counterstain (blue). Immunohistochemical staining of perfusion-fixed frozen rat brain sections using Anti-Angiotensin II Receptor Type-2 (extracellular)-ATTO-488 Antibody (#AAR-012-AG), (1:60) and Anti-VGLUT2-ATTO-594 Antibody (#AGC-036-AR), (1:60). A. AT2 receptor staining (green). B. VGLUT2 staining (red). C. Merge of the two images shows a general lack of co-localization of AT2R and VGLUT2 in this part of the hypothalamus (arrow). 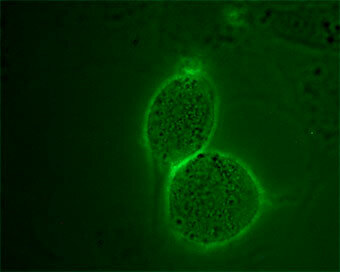 Cell nuclei are stained with DAPI (blue). Cell surface detection of Angiotensin II receptor type-2 in intact live mouse 3T3-L1 cells with Anti-Angiotensin II Receptor Type-2 (extracellular)-ATTO-488 Antibody (#AAR-012-AG), (1:50), (green). Live view of the same field was superimposed to the fluorescent one. Angiotensin II receptor type 2 or AT2 is one of the receptors that bind the octapeptide hormone Angiotensin II (Ang II). Although the AT2 receptor is structurally a member of the GPCR superfamily, the signaling mechanisms elicited following AT2 receptor activation are not fully clarified. Recent evidence indicates that the AT2 receptor signals through the Giα2 and the Giα3 proteins and through the activation of phosphotyrosine phosphatases such as SHP-1. AT2 receptor distribution is more restricted than that of the AT1 receptor. The highest expression levels of AT2 have been found in the fetus, which is followed by a marked decrease shortly after birth. Nevertheless, significant AT2 receptor expression can be detected in the heart, kidney, vascular endothelial cells and brain, among others. Immuno-colocalization of Melatonin Receptor Type 1B and AT2 Receptor in rat brainImmunohistochemical staining of perfusion-fixed frozen brain sections using Anti-Melatonin Receptor 1B (MTNR1B) Antibody (#AMR-032), (1:600) and Anti-Angiotensin II Receptor Type-2 (extracellular)-ATTO-488 Antibody (#AAR-012-AG), (1:100). A. MTNR1B staining (red) (arrows). B. The same section labeled for AT2 receptor (green). C. Merge of the two images suggests considerable co-localization in the paraventricular nucleus (arrows). For orientation, note localization with respect to 3rd ventricle (3rd V). Anti-Angiotensin II Receptor Type-2 (extracellular) Antibody (#AAR-012) is a highly specific antibody directed against an extracellular epitope of the rat protein. The antibody can be used in western blot, immunocytochemistry and immunohistochemistry applications. It has been designed to recognize AT2 receptor from rat and mouse samples. The antibody won’t recognize human AT2R. Anti-Angiotensin II Receptor Type-2 (extracellular)-ATTO-488 Antibody (#AAR-012-AG) is directly labeled with an ATTO-488 fluorescent dye. ATTO dyes are characterized by strong absorption (high extinction coefficient), high fluorescence quantum yield, and high photo-stability. The ATTO-488 label is analogous to the well known dye fluorescein isothiocyanate (FITC) and can be used with filters typically used to detect FITC. Anti-Angiotensin II Receptor Type-2 (extracellular)-ATTO-488 Antibody has been tested in live cell imaging and immunohistochemical applications and is specially suited to experiments requiring simultaneous labeling of different markers. Anti-Angiotensin II Receptor Type-2 (extracellular) Antibody (#AAR-012), (for western blot analysis).